Today was blue day at school! Katie kept insisting it was PINK day. Since I'm the one that knows how to read the school calendar, she wore blue! She told me that they got to eat blueberry muffins, so that's pretty exciting. Also, I got this cabinet organized today. Pretty exciting too, right? It only got done, because my mom helped me. She's type A and LOVES to organize. I'm type Z. I don't know if that is really a type, but I am opposite of A. If you come to my house it would look clean. (if I knew you were coming over ,that is) BUT my closets and cabinets are a disaster. I'm a shover. I shove stuff in spots when I'm trying to clean up in a hurry. I don't have time to put stuff back where it belongs! So eventually I am going to go through each room, closet, and cabinet, and make sure they are organized...with the help of my mom! After school, Katie wanted to have a tea party. I think she drank 3 tea pots full of water! 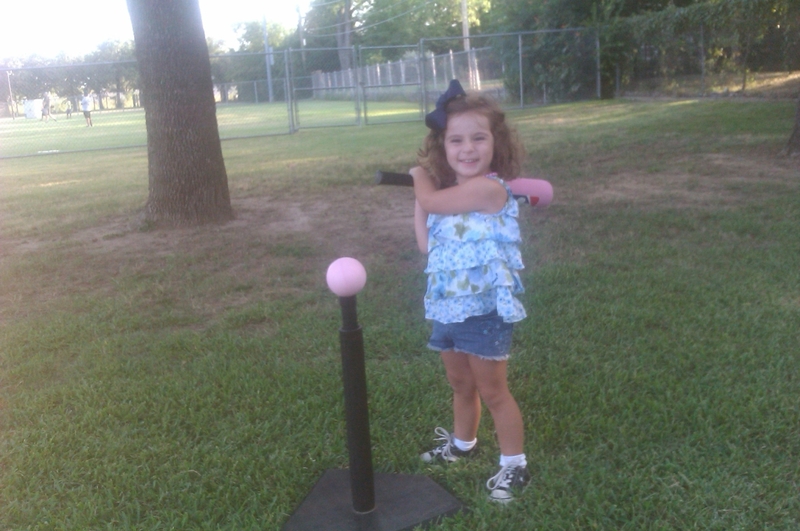 And then after the princess tea party, she played some T-ball with her daddy! I'm glad she's so well rounded. She's a little bit of mommy and a little bit of daddy. She's also a little bit of her Nonni. She puts all her toys back where they belong, and she wouldn't dare let me just throw a stray lego in her closet! I've tried several times, and it gets put away properly...by the 3 year old! Hopefully she'll just inherit all of the good stuff from us, and none of the crazy! My Mom used to come over and help me organize and clean. Seeing your post really makes me miss my Mom. Enjoy all the times you get to have cleaning and organizing with your Mom. Ha Ha!! My house looks super clean from the outside too...PLEASE don't open the cabinets!! And NEVER open my closet door! "I'm type Z" lolol.... I'm right there with you... I love organization, but I don't have the organizational skills to actually do it so my mom always comes and gets me organized too! LOL at Type Z! I can relate!